Located in Eastern Oklahoma about three miles south of Baggs, Greenleaf State Park (www.facebook.com/Greenleaf-State-Park-1022360781141282/) is touted as one of the state’s most scenic state parks. And although the Civilian Conservation Corps constructed some native stone cabins in this 565-acre green space back in the 1930s, they’re not exactly wheelchair-accessible. That said, the Oklahoma Chapter of the Telephone Pioneers of America remedied that oversight in 1994, when they erected the ultra accessible Cabin on the Lake. 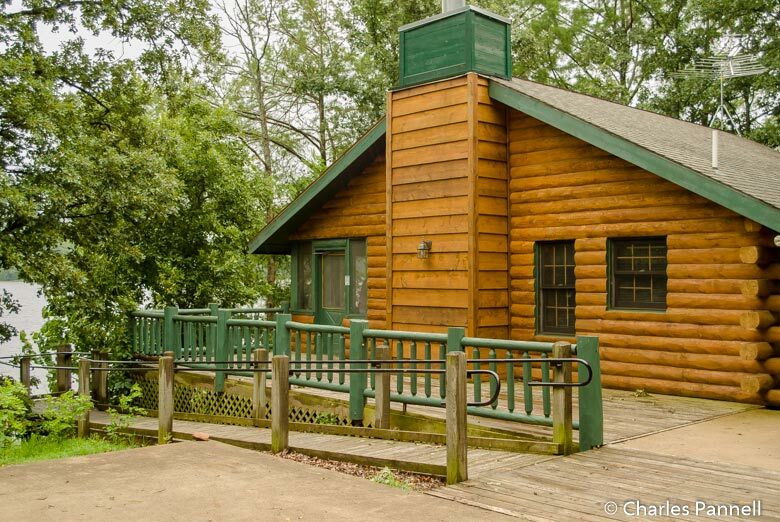 Today, Greenleaf State Park is a top choice for wheelers and slow walkers who want to take a hike, drop their line and spend the night in an accessible lakeside cabin. The modern Cabin on the Lake offers a high degree of privacy, as it’s located at the end of a secluded road, well away from the other cabins. There is a paved parking area in front of the cabin, with ramped access to the screened-in porch that overlooks the lake. The layout is spacious, with barrier-free access to the open great room, the adjacent kitchen and an oversized bedroom furnished with a queen-sized bed and a twin hospital bed. 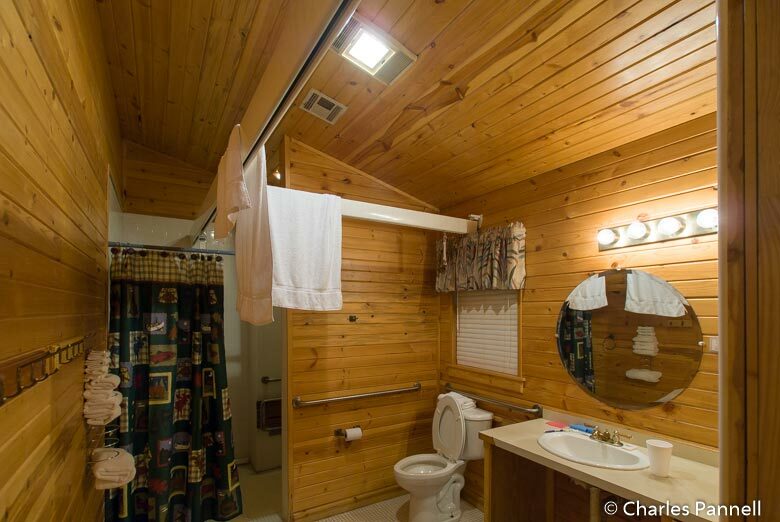 The bathroom is equipped with a roll-in shower with grab bars, a hand-held showerhead and a fold-down shower seat. Other access features include toilet grabs and a roll-under sink. As an added bonus, the cabin comes stocked with a wide variety of adaptive equipment, including a commode chair, a trapeze, a ceiling track lift in the bedroom and bathroom, and a manual wheelchair. Best of all, there is level access down to a private dock, where you can fish, enjoy the lake view or even tie up your own boat. 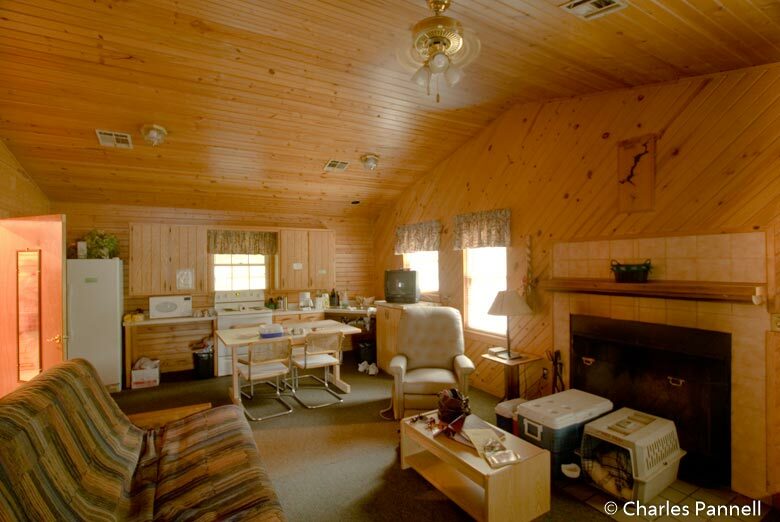 The Cabin on the Lake cannot be reserved online, but priority is given to disabled visitors. For more information about this very accessible lodging option call (918) 487-5196 or e-mail greenleafcabins@travelok.com. If you’d like to explore the park on foot, then make plans to hike along the 1.5-mile Family Fun Trail. Although this paved trail technically begins near the park office, there are several other access points throughout the park. Wheelchair access is excellent along this wide level trail, which winds past the campgrounds and through a wooded area. Interpretive signs are located along the trail, and it’s a great option for wheelers and slow walkers. The trail also passes by the kid’s fishing pond, where children under 16 and disabled visitors can catch their limit for free. If you’d prefer to fish on Greenleaf Lake, then head on down to the marina, where you’ll find an accessible floating dock, which was built with a generous donation from the Paralyzed Veterans of America. Greenleaf Lake is known for its great fishing, with lots of largemouth bass, crappie and catfish to be had. And since the accessible fishing dock is partially covered, it also offers some much-needed protection from the elements. 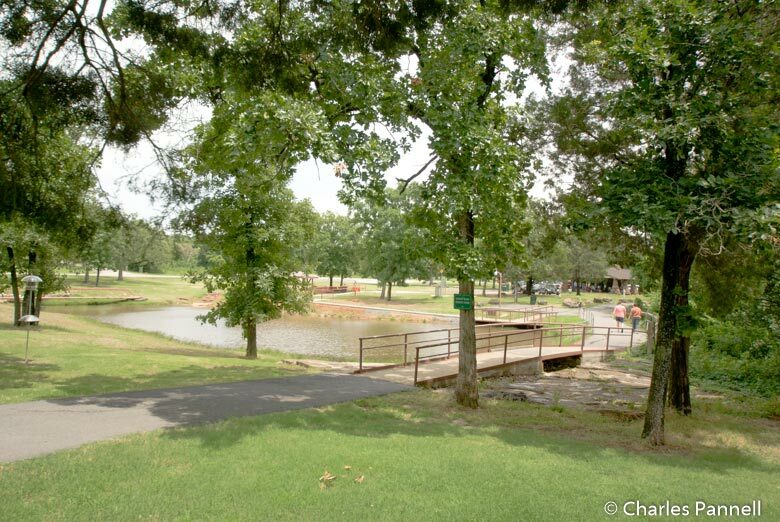 Best of all, there’s no admission charge to Greenleaf State Park, and the Cabin on the Lake is quite affordable; so not only is a visit to this Oklahoma gem very accessible, but it’s also easy on the old wallet.